These days many people recycle their plastic drink containers and water bottles. Turns out though that the lids that come on those containers hold quite a controversy. Some sources say as long as they are reattached to their original container it’s okay to place them out with your curbside recycling. Other sources say that the melting point for lids is different than that of the containers, therefore the lids will contaminate the load. That leaves many of us with a collection of lids to use for crafting. I have a rather large container full of all sorts of plastic lids, bottle caps and tops. Instead of wrestling with whether I should recycle them or throw them away, I save them and use them in fun art projects such as this one. Cover the cardboard with scrapbook paper using tacky glue. Position your lids in the shape of a tree. Once they are where you want them, glue them to the cardboard. 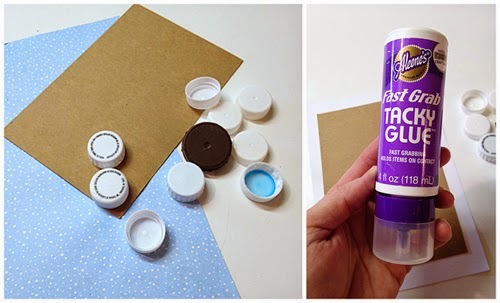 Add dots of glue to the plastic lids. 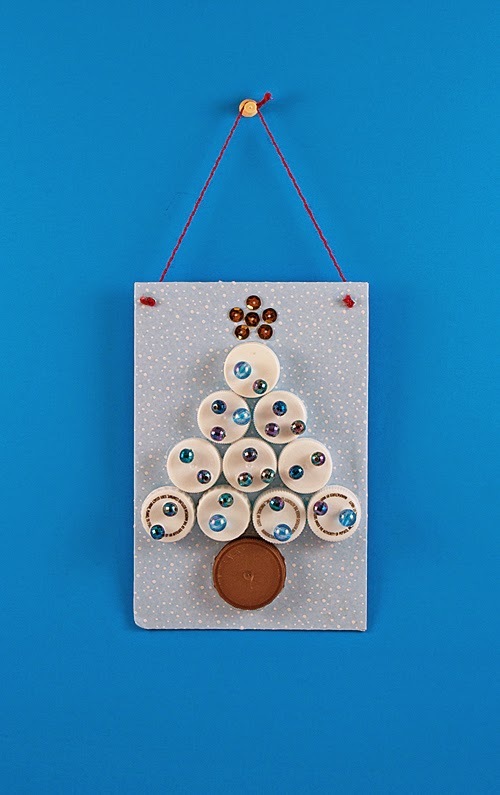 Place beads into the dots of glue. Glue sequins at the top of the tree in the shape of a star. Use yarn to make a simple hanger. Hope you enjoyed this project with the kids! Have fun! Nice website and everybody should totally comply with the author on this one here. Its hilarious, that's what i should write about this post. Because this should be what the whole internet thing is all about right? Keep on doing a great job!